Mobile phones for kids? You silly billies! Why solve a problem that doesn't exist? Is the 1stFone really such a great idea? The 1stFone couldn't be more different to the iPhone 5, HTC One or Samsung Galaxy S4: it doesn't run apps, it can't connect to the internet and it doesn't really do anything other than make and receive calls. The manufacturers call it "the dumbphone for smart parents", and I'm completely baffled by it. I'm not baffled by it because it's complicated. It isn't. 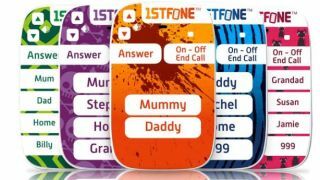 The 1stFone is a super-simple mobile phone for children that stores up to 12 speed dial numbers and (optionally) can call 999 in case of emergency. There's no texting, no internet, no apps. The child can call the numbers and you can call the child, and that's it. What baffles me is who on Earth might want to buy it. The 1stFone is aimed at four- to nine-year-olds, and that immediately raises two questions. One, what self-respecting nine-year-old will want to be seen with a 1stFone? And two, who the hell gives phones to four-year-olds? I can see why you might want your nine-year-old to have a mobile: at that age children are often fiercely independent, so giving them a mobile would provide both parental peace of mind and the ability to yell dire threats at your offspring when they don't come back on time. I don't think the 1stFone is that phone, though. It's £55, and a Nokia 100 is currently £7.95 on Pay As You Go. Programming a Nokia's speed dial is hardly a major undertaking, the 100 is almost as basic as a 1stFone, and it looks a lot more grown-up too. As for four-year-olds, I really don't get it. I wouldn't dream of giving my five-year-old daughter a phone. That isn't because the government guidelines advise against mobiles for children. It's because I can't imagine any circumstances in which my daughter would need one. If she's not with us, she's supervised by responsible adults - and those adults can use their phones to get me if they need to. If you think your four-year-old child needs a panic button, you need to seriously rethink your childcare arrangements. The 1stFone is pitched as a safety device, a phone whose basic functionality eliminates the risks of children experiencing sexting and cyberbullying, phone-related muggings or stumbling across online filth or gore. But you don't need a 1stFone for that: you need a NoPhone. When your child asks if they can have a phone, you say "no".